Serious commentators on the labor upheavals of the Depression years seem to agree that disturbances of all kinds, including the wave of sit-down strikes of 1936 and 1937, were caused by the 'speed-up' above all. Dissatisfaction among production workers with their new CIO unions set in early, however, mainly because the unions made no efforts to challenge management's right to establish whatever kind of work methods and working conditions they saw fit. The 1945 Trends in Collective Bargaining study noted that "by around 1940" the labor leader had joined the business leader as an object of "widespread cynicism" to the American employee. Later in the 1940s C. Wright Mills, in his The New Men of Power: Amenca's Labor Leaders, described the union's role thusly: "the integration of union with plant means that the union takes over much of the company's personnel work, becoming the discipline agent of the rank-and-flle." In the mid-1950s, Daniel Bell realized that unionization had not given workers control over their job lives. Struck by the huge, Spontaneous walk-out at River Rouge in July. 1949, over the speed of the Ford assembly line, he noted that "sometimes the constraints of work explode with geyser suddenness." And as Bell's Work and Its Discontents (1956) bore witness that "the revolt against work is widespread and takes many forms,"so had Walker and Guest's Harvard study, The Man on the Assembly Line (1953), testified to the resentment and resistance of the man on the line. Similarly, and from a writer with much working class experience himself, was Harvey Swados' "The Myth of the Happy Worker," published in The Nation, August, 1957, Workers and the unions continued to be at odds over conditions of work during this period. In auto, for example, the 1955 contract between the United Auto Workers and General Motors did nothing to check the 'speed-up' or facilitate the settlement of local shop grievances. Immediately after Walter Reuther made public the terms of the contract he'd just signed, over 70% of GM workers went on strike. An even larger percentage 'wildcatted' after the signing of the 1958 agreement because the union had again refused to do anything about the work itself. For the same reason, the auto workers walked off their jobs again in 1961, closing every GM and a large number of Ford plants. Paul Jacobs' The State of the Unions, Paul Saltan's The Disenchanted Unionist, and BJ. Widick's The Triumphs and Failures of Unionism in the United States were some of the books written in the early 1960s by pro-union' figures, usually former activists, who were disenchanted with what they had only lately and partially discovered to he the role of the unions. A black worker, James Boggs, clarified the process in a sentence: "Looking backwards, one will find that side by side with the fight to control production, has gone the struggle to control the union, and that the decline has taken place simultaneously on both fronts. " What displeased Boggs, however, was lauded by business. In the same year that his remarks were published, Fortune, American capital's most authoritative magazine, featured as a cover story in its May, 1963 issue Max Way's "Labor Unions Are Worth the Price. But by the next year, the persistent dissatisfaction of workers was beginning to assume public prominence, and a June, 1964 Fortune article reflected the growing pressure for union action: "Assembly-line monotony, a cause reminiscent of Charlie Chaplin's Modern Times, is being revived as a big issue in Detroit's 1964 negotiations, it reported. In the middle-1960's another phenomenon was dramatically and violently making itself felt. The explosions in the black ghettoes appeared to most to have no connection with the almost underground fight over factory conditions. But many of the participants in the insurrections in Watts, Detroit and other cities were fully employed. according to arrest records. The struggle for dignity in one's work certainly involved the black workers, whose oppression was, as in all other areas, greater than that of non-black workers. Jessie Reese, a Steelworkers' union organizer, described the distrust his fellow blacks felt toward him as an agent of the union: "To organize that black boy out there today you've got to prove yourself to him, because he don't believe nothing you say." Authority is resented, not color. Turning to more direct forms of opposition to an uncontrolled and alien job world, we encounter the intriguing experience of Bill Watson, who spent 1968 in an auto plant near Detroit. Distinctly post-union in practice, he witnessed the systematic, planned efforts of the workers to substitute their own production plans and methods for those of management. He described it as "a regular phenomenon" brought out by the refusal of management and the UAW to listen to workers' suggestions as to modifications and improvements in the product. "The contradictions of planning and producing poor quality, beginning as the stuff of jokes, eventually became a source of anger. - temporary deals unfolded between inspection and assembly and between assembly and trim, each with planned sabotage... the result was stacks upon stacks of motors awaiting repair. . it was almost impossible to move. ..the entire six-cylinder assembly and inspection operation was moved away-where new workers were brought in to man it. In the most dramatic way, the necessity of taking the product out of the hands of laborers who insisted on planning the product' became overwhelming." The extent and co-ordination of the workers' own organization in the plant described by Watson was very advanced indeed, causing him to wonder if it wasn't a glimpse of a new social form altogether. arising from the failure of unionism. Stanley Weir, writing at this time of similar if less highly developed phenomena, found that "in thousands of industrial establishments across the nation, workers have developed informal underground unions" due to the deterioration or lack of improvement in the quality of their daily job lives." Until the 1 970s - and very often still - the wages and benefits dimension of a work dispute, that part over which the union would become involved, received almost all the attention. In 1965 Thomas Brooks observed that the "apathy" of the union member stemmed from precisely this false emphasis: ". . - grievances on matters apart from wages are either ignored or lost in the limbo of union bureaucracy." A few years later, Dr. David Whitter, industrial consultant to GM, admitted, "That [more money] isn't all they want; it's all they can get." As the 1960s drew to a close, some of the more perceptive business observers were about to discover this distinction and were soon forced by pressure from below to discuss it publicly. While the October, 1969, Fortune stressed the preferred emphasis on wages as the issue in Richard Armstrong's "Labor 1970: Angry Aggressive, Acquisitive" (while admitting that the rank and file was in revolt "against its own leadership, and in important ways against society itself'), the July, 1970 issue carried Judson Gooding's "Blue-Collar Blues on the Assembly Line: Young auto workers find job disciplines harsh and uninspiring, and they vent their feelings through absenteeism, high turnover, shoddy work, and even sabotage. It's time for a new look at who's down on the line. With the 1970s there has at last begun to dawn the realization that on the most fundamental issue, control of the work process, the unions and the workers are very much in opposition to each other. A St. Louis Teamster commented that traditional labor practice has as a rule involved "giving up items involving workers' control over the job in exchange for cash and fringe benefits." Acknowledging the disciplinary function of the union, he elaborated on this time-honored bargaining: Companies have been willing to give up large amounts of money to the union in return for the union's guarantee of no work stoppages." Daniel Bell wrote in 1973 that the trade union movement has never challenged the organization of work itself, and summed up the issue thusly: "The crucial point is that however much an improvement there may have been in wage rates, pension conditions, supervision, and the like, the conditions of work themselves- the control of pacing, the assignments, the design and layout of work - are still outside the control of the worker himself. " Although the position of the unions is usually ignored, since 1970 there has appeared a veritable deluge of articles and books on the impossibility to ignore rebellion against arbitrary work roles. From the covers of a few national magazines: Barbara Garson's "The Hell With Work," Harper's, June, 1972; Ltfe magazine's "Bored On the Job: Industry Contends with Apathy and Anger on the Assembly Line," September 1, 1972; and "Who Wants to Work?" in the March 26, 1973 Newsweek. Other articles have brought out the important fact that the disaffection is definitely not confined to industrial workers. To cite just a few: Judson Gooding's "The Fraying White Collar" in the December, 1970 Fortune, Timothy Ingram's "The Corporate Underground," in The Nation of September 13, 1971, Marshall Kilduffs "Getting Back at a Boss: The New Underground Papers," in the December 27, 1971 San Francisco Chronicle, and Seashore and Barnowe's "Collar Color Doesn't Count," in the August. 1972 Psychology Today. In 1971 The Workers, by Kenneth Lasson, was a representative book, focusing on the growing discontent via portraits of nine blue-collar workers. The Job Revolution by Judson Gooding appeared in 1972, a management-oriented discussion of liberalizing work management in order to contain employee pressure. The Report of a Special Task Force to the Secretary of Health, Education, and Welfare on the problem. titled Work in America, was published in 1973. Page 19 of the study admits the major facts: "absenteeism, wildcat strikes. turnover, and industrial sabotage [have) become an increasingly significant part of the cost of doing business." The scores of people interviewed by Studs Terkel in his Working: People Talk A bout What They Do All Day and How They Feel about What They Do (1 974), reveal a depth to the work revolt that is truly devastating. His book uncovers a nearly unanimous contempt for work and the fact that active resistance is fast replacing the quiet desperation silently suffered by most. Prom welders to editors to former executives, those questioned spoke up readily as to the feelings of humiliation and frustration. If most of the literature of "the revolt against work" has left the unions out of their discussions, a brief look at some features of specific worker actions from 1970 through 1973 will help underline the comments made above concerning the necessarily anti-union nature of this revolt. During March, 1970. a wildcat strike of postal employees. in defiance of union orders, public employee anti-strike law, and federal injunctions, spread across the country disabling post offices in more than 200 cities and towns.In New York, where the strike began, an effigy of Gus Johnson, president of the letter carriers' union local there, was hung at a tumultous meeting on March 21 where the national union leaders were called "rats" and "creeps." 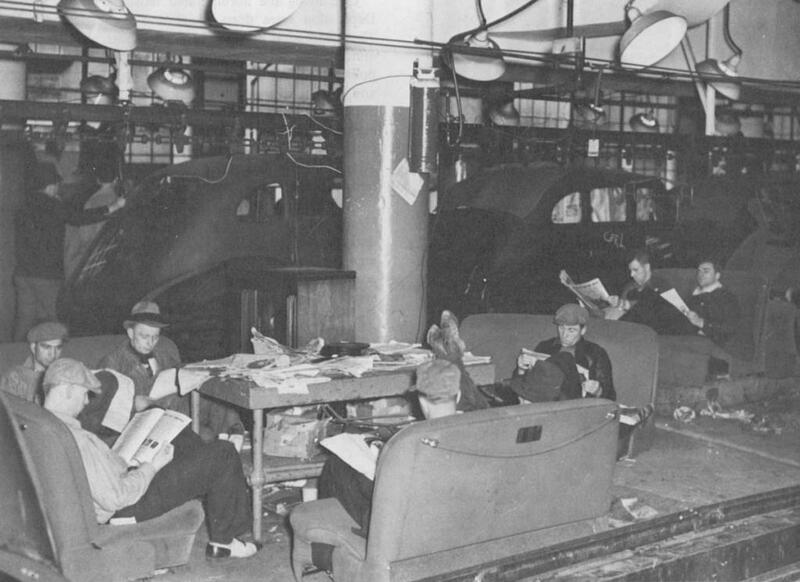 In many locations, the workers decided to not handle business mail, as part of their work action, and only the use of thousands of National Guardsmen ended the strike, major issues of which were the projected layoff of large numbers of workers and methods of work. In July, 1971, New York postal workers tried to renew their strike activity in the face of a contract proposal made by the new letter carrier president, Vincent Sombrotto. At the climax of a stormy meeting of 3,300 workers, Sombrotto and a lieutenant were chased from the hall and down 33rd Street, narrowly escaping 200 enraged union members, who accused them of "selling out" the membership. Returning to the Spring of 1970, 100,000 Teamsters in 16 cities wildcatted between March and May to overturn a national contract signed March 23 by IBT President Fitzsimmons. The ensuing violence in the Middle West and West Coast was extensive, and in Cleveland involved no less than a thirty-day blockade of main city thoroughfares and 67 million dollars in damages. On May 8,1970, a large group of hard-hat construction workers assaulted peace demonstrators in Wall Street and invaded Pace College and City Hall itself to attack students and others suspected of not supporting the prosecution of the Vietnam war. The riot, in fact, was supported and directed by construction firm executives and union leaders, in all likelihood to channel worker hostility away from themselves. Perhaps alone in its comprehension of the incident was public television (WNET, New York) and its "Great American Dream Machine" program aired May 13. A segment of that production uncovered the real job grievances that apparently underlined the affair. Intelligent questioning revealed, in a very few minutes, that "commie punks" were not wholly the cause of their outburst, as an outpouring of gripes about unsafe working conditions, the strain of the work pace, the fact that they could be fired at any given moment, etc., was recorded. The head of the New York building trades union, Peter Brennan, and his union official colleagues were feted at the White House on May 26 for their patriotism - and for diverting the workers? - and Brennan was later appointed Secretary of Labor. In July, 1970, on a Wednesday afternoon swing shift a black auto worker at a Detroit Chrysler plant pulled out an M-1 carbine and killed three supervisory personnel before he was subdued by UAW committeemen. It should be added that two others were shot dead in separate auto plant incidents within weeks of the Johnson shooting spree, and that in May, 1971 a jury found Johnson/innocent because of insanity after visiting and being shocked by what they considered the maddening conditions at Johnson's place of work. The sixty-seven day strike at General Motors by the United Auto Workers in the Fall of 1970 is a classic example of the anti-employee nature of the conventional strike, perfectly illustrative of the ritualized manipulation of the individual which is repeated so often and which changes absolutely nothing about the nature of work. A Wall Street Journal article of October 29, 1970 discussed the reasons why union and management agreed on the necessity of a strike. The UAW saw that a walk-out would serve as "an escape valve for the frustrations of workers bitter about what they consider intolerable working conditions," and a long strike would "wear down the expectations of members." The Journal went on to point out that, "among those who do understand the need for strikes to ease intra-union pressures are many company bargainers. - - They are aware that union leaders may need such strikes to get contracts ratified and get re-elected." Or, as William Serrin succinctly put it: "A strike, by putting the workers on the street, rolls the steam out of them it reduces their demands and thus brings agreement and ratification; it also solidifies the authority of the union hierarchy. " Thus, the strike was called. The first order of the negotiating business was the dropping of all job condition demands, which were only raised in the first place as a public relations gesture to the membership. With this understood, the discussions and publicity centered around wages and early retirement benefits exclusively, and the charade played itself out to its pre-ordained end. "The company granted each demand [UAW president] Woodcock had made, demands he could have had in September. "Hardly surprising, then, that GM loaned the union $23 million per month during the strike? As Serum conceded, the company and the union are not even adversaries, much less enemies. In November, 1970, the fuel deliverers of New York City. exasperated by their union president's resistance to pleas for action, gave him a public beating. Also in New York, in the following March the Yellow Cab drivers ravaged a Teamsters' Union meeting hall in Manhattan in response to their union officials' refusal to yield the floor to rank and file speakers. In January, 1971, the interns at San Francisco General Hospital struck, solely over hospital conditions and patient care.Eschewing any ties to organized labor, their negotiating practice was to vote publicly on each point at issue, with all interns present. The General Motors strike of 1970 discussed above in no way dealt with the content of jobs. Knowing that it would face no challenge from the UAW, especially, it was thought, so soon after a strike and its cathartic effects, GM began in 1971 a co-ordinated effort at speeding up the making of cars, under the name General Motors Assembly Division, or GMAD. The showplace plant for this re-organization was the Vega works at Lordstown, Ohio, where the workforce was 85% white and the average age 27. With cars moving down the line almost twice as fast as in pre-GMAD days, workers resorted to various forms of on the job resistance to the terrific pace. GM accused them of sabotage and had to shut down the line several times. Some estimates set the number of deliberately disabled cars as high as 500,000 for the period of December, 1971 to March, 1972, when a strike was finally called following a 97% affirmative vote of Lordstown's Local 1112. But a three-week strike failed to check the speed of the line, the union, as always, having no more desire than management to see workers effectively challenging the control of production. The membership lost all confidence in the union; Gary Bryner, the 29-year-old president of Local 1112 admitted: "They're angry with the union; when I go through the plant 1 get catcalls." In the GMAD plant at Norwood, Ohio, a strike like that at Lordstown broke out in April and lasted until September, 1971. The 174 days constituted the longest walkout in GM history.The Norwood workers had voted 98% in favor of striking in the previous February, but the UAW had forced the two locals to go out separately, first Lordstown, and later Norwood, thus isolating them and protecting the GMAD program. Actually, the anti-worker efforts of the UAW go even further back, to September of 1971, when the Norwood Local 674 was put in receivership, or taken over, by the central leadership when members had tried to confront GMAD over the termination of their seniority rights. In the summer of 1973, three wildcat strikes involving Chrysler facilities in Detroit took place in less than a month. Concerning the successful one-day wildcat at the Jefferson assembly plant, UAW vice president Doug Fraser said Chrysler had made a critical mistake in "appeasing the workers" and the Mack Avenue walkout was effectively suppressed when a crowd of"UAW local union officers and committeemen,armed with baseball bat" and clubs, gathered outside of the plant gates to 'urge' the workers to return." October, 1973 brought the signing of a new three-year contract between Ford and the UAW. But with the signing, appeared fresh evidence that workers intend to involve themselves in decisions concerning their work lives: "Despite the agreement, about 7,700 workers left their jobs at seven Ford plants when the strike deadline was reached, some because they were unhappy with the secrecy surrounding the new agreement." With these brief remarks on a very small number of actions by workers, let us try to arrive at some understanding of the overall temper of American wage-earners since the mid-1960s. "The configuration of strikes since 1967 is unprecedented in the history of American workers. The number of strikes as a whole, as well as rank-and-file rejections of proposed union settlements with employers. and wildcat actions has exceeded that in any similar period in the modern era. "And as Sennett and Cobb, writing in 1971 made clear, the period has involved "the most turbulent rejection of organized union authority among young workers." The 1970 GM strike was mentioned as an example of the usefulness of a sham struggle in safely releasing pent-up employee resentment. The nation-wide telephone workers' strike of July, 1971 is another example, and the effects of the rising tide of anti-union hostility can also be seen in it. Rejecting a Bell System offer of a 30% wage increase over three years, the Communication Workers' union called a strike, publicly announcing that the only point at issue was that "we need 31 to 32 per cent,"as union president Joseph Beirne put it. After a six-day walkout, the 1% was granted, as was a new Bell policy requiring all employees to join the union and remain in good standing as a condition of employment. But while the CWA was granted the standard 'union-shop' status, a rather necessary step for the fulfillment of its role as a discipline agent of the work force, thousands of telephone workers refused to return to their jobs, in some cases staying out for weeks in defiance of CWA orders. The calling of the 90-day wage-price freeze on August 15 was in large part a response to the climate of worker unruliness and independence, typified by the defiant phone workers. Aside from related economic considerations, the freeze and the ensuing controls were adopted because the unions needed government help in restraining the workers. Sham strikes clearly lose their effectiveness if employees refuse to play their assigned roles remaining. for example, on strike on their own. George Meany, head of the AFL-CIO, had been calling for a wage-price freeze since 1969,and in the weeks prior to August 15 had held a number of very private meetings with President Nixon. Though he was compelled to publicly decry the freeze as "completely unfair to the worker" and "a bonanza to big business," he did not even call for an excess profits tax; he did come out strongly for a permanent wage-price control board and labor's place on it, however. It seems clear that business leaders understood the need for government assistance. In September, a Fortune article proclaimed that "A system of wage-price review boards is the best hope for breaking the cost-push momentum that individual unions and employers have been powerless to resist. "As workers try to make partial compensation for their lack of autonomy on the job by demanding better wages and benefits, the only approved concessions, they create obvious economic pressure especially in an inflationary period. Arthur M. Louis, in November's Fortune, realized that the heat had been on labor officials for some time. Speaking of the "rebellious rank and file" of longshoremen, miners, and steelworkers, he said, "Long before President Nixon announced his wage-price freeze, many labor leaders were calling for stabilization, if only to get themselves off the hook." A Fortune editorial ofJanuary (1972) predicted that by the Fall, a national "wave of wildcat strikes" might well occur and the labor members of the tripartite control board would resign. In fact, Meany and Woodcock quit the Pay Board much earlier in the year than that, due precisely to the rank and file's refusal to support the plainly anti-labor wage policies of the board. Though Fitzsimmons of the Teamsters stayed on, and the controls continued, through a total of four "Phases" until early 1974, the credibility of the controls program was crippled, and its influence waned rapidly. Though the program was brought to a premature end, the Bureau of Labor Statistics gave its ceiling on wage increases much of the credit for the fact that the number of strikes in 1972 was the smallest in five years. During "Phase One" of the controls, the 90-day freeze, David Deitch wrote that "the new capitalism requires a strong. centralized trade union movement with which to bargain." He made explicit exactly what kind of "strength" would be needed: "The labor bureaucracy must ultimately silence the rank and file if it wants to join in the tripartite planning, in the same sense that the wildcat strike cannot be tolerated. " In this area, too, members of the business community have shown an understanding of the critical role of the unions. In May, 1970, within hours of the plane crash that claimed UAW chief Walter Reuther, there was publicly expressed corporate desire for a replacement who could continue to effectively contain the workers. "It's taken a strong man to keep the situation under control," Virgil Boyd. Chrysler vice chairman, told the New York Times. "I hope that whoever his successor is can exert great internal discipline." Likewise, Fortune bewailed the absence of a strong union in the coalfields. in a 1971 article subtitled, "The nation's fuel supply, as well as the industry's prosperity. depends on a union that has lost control of its members." Despite the overall failure of the wage control program, the government has been helping the unions in several other ways. Since 1970, for example, it has worked to reinforce the conventional strike - again due to its important safety-valve function. In June, 1970, the U.S. Supreme Court ruled that an employer could obtain an injunction to force employees back to work when a labor agreement contains a no-strike pledge and an arbitration clause. "The 1970 decision astonished many observers of the labor relations scene, "directly reversing a 1962 decision of the Court, which ruled that such walkouts were merely labor disputes and not illegal. Also in 1970, during the four-month General Electric strike, Schenectady. New York, officials "pleaded with non-union workers to refrain from crossing picket lines on the grounds that such action might endanger the peace." A photo of the strike scene in Fortune was captioned. "Keeping workers out-workers who were trying to cross picket lines and get to their jobs - became the curious task of Schenectady policemen. " A Supreme Court decision in 1972 indicated how far state power will go to protect the spectacle of union strikes. Four California Teamsters were ordered reinstated with five years' back pay as a unanimous Supreme Court ruled [November 7, 1972] that it is unfair labor practice for an employer to fire a worker solely for taking part in a strike." Government provides positive as well as negative support to approved walkouts, too. An 18-month study by the Wharton School of Finance and Commerce found that welfare benefits, unemployment compensation, and food stamps to strikers mean that "the American taxpayer has assumed a significant share of the cost of prolonged work stoppages." But in some areas, unions would rather not even risk official strikes. The United Steelworkers of America - which allows only union officials to vote on contract ratifications, by the way, agreed with the major steel companies in March, 1973 that only negotiations and arbitration would be used to resolve differences. The Steelworkers' contract approved in April, 1974 declared that the no-strike policy would be in effect until at least 1980. A few days before, in March, a federal court threw out a suit filed by rank and file steelworkers, ruling that the union needn't be democratic in reaching its agreements with management. David Deitch, quoted above, said that the stability of the system required a centralized union structure. The process of centralization has been a fact and its acceleration has followed the increasing militancy of wage-earners since the middle-1960s. A June. 1971, article in the federal Monthly Labor Review discussed the big increase in union mergers over the preceding three years August, 1972, saw two such mergers, the union of the United Papermakers and Paperworkers and the International Brotherhood of Pulp, Sulphite, and Paper Mill Workers, and that of the United Brewery Workers with the Teamsters In a speech made on July 5, 1973, Longshoremen's president Harry Bridges called for the formation of "one big national labor movement or federation." The significance of this centralization movement is that it places the individual even further from a position of possible influence over the union hierarchy-at a time when he is more and more likely to be obliged to join a union as a condition of employment. The situation is beginning to resemble in some ways the practice in National Socialist Germany, of requiring the membership of all workers in 'one big, national labor movement or federation,' the Labor Front. In the San Francisco Bay area, for example, in 1969, "A rare-and probably unique-agreement that will require all the employees of a public agency to join a union or pay it the equivalent of union dues was reported in Oakland by the East Bay Regional Park District." And in the same area this process was upheld in 1973: "A city can require its employees to pay the equivalent of initiation fees and dues to a union to keep their jobs, arbitrator Robert E. Burns has ruled in a precedent-setting case involving the city of Hayward. "This direction is certainly not limited to public employees. according to the Department of Labor. Their "What Happens When Everyone Organizes" article implied the inevitability of total unionization. Though a discussion of the absence of democracy in unions is outside the scope of this essay, it is important to emphasize the lack of control possessed by the rank and file. In 1961 Joel Seidman commented on the subjection of the typical union membership: "It is hard to read union constitutions without being struck by the many provisions dealing with the obligations and the disciplining of members, as against the relatively small number of sections concerned with members' rights within the organization. "Two excellent offerings on the subject written in the 1970s are Autocracy and Insurgency in Organized Labor by Burton Hal and "Apathy and Other Axioms: Expelling the Union Dissenter from History," by Il.W. Benson. Relatively unthreatened by memberships. the unions have entered into ever-closer relations with government and business. A Times-Post Service story of April. 1969, disclosed a three-day meeting between AFL-CIO leadership and top Nixon administration officials. shrouded in secrecy at the exclusive Greenbriar spa. "Big labor and big government have quietly arranged an intriguing tryst this week in the mountains of West Virginia - for a private meeting involving at least half a dozen cabinet members." Similarly, a surprising New York Times article appearing on the last day of 1972 is worth quoting for the institutionalizing of government-labor ties it augurs: "President Nixon has offered to put a labor union representative at a high level in every federal government department, a well-informed White House official has disclosed. The offer, said to be unparalleled in labor history, was made to union members on the National Productivity Commission, including George Meany, president of the AFL-CIO and Frank E. Fitzsimmons, president of the IBT, at a White House meeting last week... labor sources said that they understood the proposal to include an offer to place union men at the assistant secretary level in all relevant government agencies.. - should the President's offer be taken up, it would mark a signal turning point in the traditional relations between labor and government. " In Oregon, the activities of the Associated Oregon Industries, representing big business and the Oregon AFL-CIO, by the early '70s reflected a close working relationship between labor and management on practically everything. Joint lobbying efforts, against consumer and environmentalist proposals especially, and other forms of cooperation led to an exchange of even speakers at each other's conventions in the Fall of 1971. On September 2, the president of the AOI, Phil Bladine, addressed the AFL-CIO; on September18, AFL-CIO president Ed Whalen spoke before the AOI. In California, as in many other states, the pattern has been very much the same, with labor and business working together to attack conservationists in 1972 and defeat efforts to reform campaign spending in 1974, for example. Also revealing is the "Strange Bedfellows From Labor, Business' Own Dominican Resort" article on the front page of the May 15,1973 Wall Street Journal by Jonathon Kwitney. Among the leading stockholders in the 15,000 acre Punta Cana, Dominican Republic resort and plantation are George Meany and Lane Kirkland, president and secretary-treasurer of the AFL-CIO, and Keith Terpe, Seafarers' Union official, as well as leading officers of Seatrain Lines, Inc., which employs members of Terpe's union. Not seen for what they are, the striking cases of mounting business-labor-government collusion and cooperation have largely been overlooked. But those in a position to see that the worker is more and more actively intolerant of a daily work life beyond his control, also realize that even closer cooperation is necessary. In early 1971 Personnel, the magazine of the American Management Association, said that "it is perhaps time for a marriage of convenience between the two [unions and management] "for the preservation of order. Pointing out, however, that many members "tend to mistrust the union." The reason for this "mistrust," as we have seen, is the historical refusal of unions to interfere with management's control of work. The AFL-CIO magazine, The American Federationist, admitted labor's lack of interest and involvement in an article in the January. 1974 issue entitled "Work is Here to Stay, Alas." And the traditional union position on the matter is why, in turn, C. Jackson Grayson, Dean of the School of Business Administration at Southern Methodist University and former chairman of the Price Commission, called in early 1974 for union-management collaboration. The January 12 issue of Business Week contains his call for a symbolic dedication on July 4, 1976, "with the actual signing of a document-a Declaration of Interdependence" between labor and business, "inseparably linked in the productivity quest." Productivity - output per hour of work - has of course fallen due to worker dissatisfaction and unrest. A basic indication of the continuing revolt against work are the joint campaigns for higher productivity. such as the widely publicized US Steel-United Steelworkers efforts. A special issue on productivity in Business Week for September 9, 1972, highlighted the problem, pointing out also the opposition workers had for union-backed drives of this kind. Closely related to low productivity. it seems, is the employee resistance to working overtime, even during economic recession. The refusal of thousands of Ford workers to overtime prompted a Ford executive in April, 1974 to say, "We're mystified by the experience in light of the general economic situation. "Also during April, the Labor Department reported that "the productivity of American workers took its biggest drop on record as output slumped in all sectors of the economy during the first quarter." In 1935 the NRA issued the Henderson Report. which counseled that "unless something is done soon, they [the workers] intend to take things into their own hands. "Something was done, the hierarchical, national unions of the CIO finally appeared and stabilized relations. In the 1970s it may be that a limited form of worker participation in management decisions will be required to prevent employees from "taking things into their own hands." Irving Bluestone. head of the UAW's GM department. predicted in early 1972 that some form of participation would be necessary. under union-management control, of course. As Arnold Tannenbaum of the Institute for Social Research in Michigan pointed out in the late 1960s, ceding some power to workers can be an excellent means of increasing their subjection. if it succeeds in giving them a sense of involvement. But it remains doubtful that token participation will assuage the worker's alienation. More likely. it will underline it and make even clearer the true nature of the union-management relationship. which will still obtain. It may be more probable that traditional union institutions, such as the paid. professional stratum of officials and representatives. monopoly of membership guaranteed by management. and the labor contract itself will be increasingly re-examined as workers continue to strive to take their work lives into their own hands.